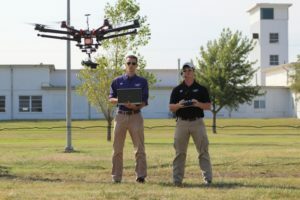 SALINA – Kansas State University Polytechnic Campus is expanding its program options with a new offering for individuals interested in cybersecurity of unmanned aircraft systems. “The unmanned aircraft systems cybersecurity graduate certificate teaches students how to ensure UAS data collection is accurate and secure, which is imperative in preventing hostile counterintelligence,” Nichols said. The graduate certificate is offered online in eight-week, interactive segments. Enrollment in the unmanned aircraft systems information assurance graduate certificate is open. For more information about how to apply, contact Kansas State Polytechnic’s office of admissions at 785-826-2640 or polytechnic@k-state.edu.